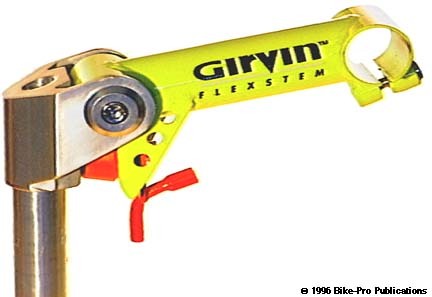 The Girvin Flexstem is one of just a few stem positioned suspension devices used on mountain bikes. 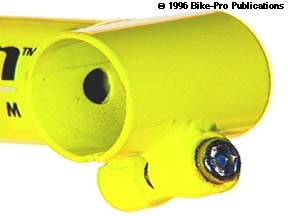 The extension and the quill are securely, bolted together in a way that permits the extension, binder and handlebar to swivel, with a thick, hard, rubber-like elastomer bushing, (spring), between them to act as a shock dampener. 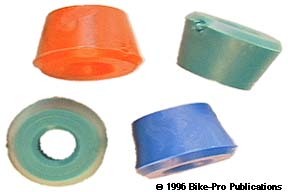 The elastomer bushing, (spring) is made in three densities, so you can adjust the amount of shock transmitted to your hands based on your, weight, riding style, and terrain. The Flexstem is designed in the United States, with the major sub-assemblies manufactured in Taiwan, by the well known stem maker Hsin Lung, who also makes stems and handlebar extensions under many well known brand names, including their own Zoom brand. (In truth, most of the stems we've written about that have "extruded aluminum wedges, with light machine work" are in fact made by Hsin Lung, which other stem makers buy from HL and use as their own.) The major sub-assemblies are shipped to Rhode Island, where the final assembly and packaging of the component parts is performed. The quill assembly is made in Taiwan, of aluminum, and that's where the "Aluminum" in the name comes from (a heavier, Cro-moly one is available). It is made of two parts, a 4mm thick aluminum tube with an extruded, then machined aluminum head piece. The extrusion is cut, milled and drilled with a Computer Numeric Controlled (CNC) lathe/miller to create the finished shape of the head. The head is press fit on to the quill with an epoxy bonding, so they are securely joined. The head and tube are then drilled and tapped for the threads of the bolt for the brake cable hanger. This bolt passes through both pieces, so separation failure could only occur if this bolt happened to shear cleanly at exactly the point where the aluminum pieces overlap. The extension Girvin refers to as a "dog bone" because it has two large joints at the ends of a smaller cylinder, like the caricature dog bone has. The extension is made of Cro-moly steel, and painted in Taiwan. It has a 28.9mm diameter cro-moly steel tube TIG welded, perpendicular to the extension at each end. At the quill end, there is a drilled out steel plate, with several "breaks", (bends in the metal to give it structure), creating a box shape that reinforces the quill/extension swivel against metal fatigue and failure. The quill end tube has a Delrin, (Teflon-like material that has a slippery surface), bushing pressed into each side. This bushing surface is what the extension swivels up and down against. Through the bushing, a machined aluminum rod, that is threaded, end to end, is pressed. This serves as the axis point for the swivel. The extension at this point slides into the quill head. From the outside, on both sides, machined aluminum caps, (like the ones used on the top of quills on other stems), with bolt head recesses are slid in. The back of the cap is turned to a 15.9mm diameter which passes through the arms of the head into the machined rod in the extension, then a bolt goes through the cap, arm, and threads into the machined rod. This forms a very stable and well supported swiveling arm. Beneath the arm, is the shock absorbing bushing, which slides over a hollow steel spindle, then the box shaped plate rests over the spindle, with another bushing, then a steel plate that has the brake cable "macaroni" welded to it. A bolt goes through all of these pieces and anchors in the tubing, bonded inside the quill head. It's less complicated than it sounds, but there's no better way to describe how solid the joint is. The binder fitting is made of machined steel rod, that's drilled and tapped for the binder bolt, welded to the front of the tube, then the tube is cut through to make the cinch system. The expander bolt is made of chrome plated steel and has thin steel washer to reduce friction when tightened. It is 135mm long, with 8mm threads by a 1.25mm thread pitch, has a 6mm hex head, and weighs, with washer 48 grams. The binder bolt is made of nickel plated steel, has a 6mm hex head, with 6mm by 1mm thread pitch, is 20mm long, weighing 6 grams. The wedge is made of cast aluminum, with light machining to finish it's shape and tap the threads. The extension on the Flexstem comes painted in a Pearl Grey or Glossy Black color. The stem is made in 100mm, 120mm, 135mm, and 150mm extension lengths, in the 1", 1 1/8" or 1 1/4" diameters. 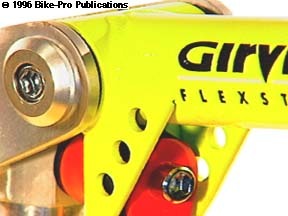 This a heavier model of the Flexstem that operates mechanically the same as the Aluminum model. The quill tube is made of 2.1mm wall thickness Cro-moly tubing, which is welded to a piece of 2.63mm thick plate steel that is cut and shaped to resemble the body and arm structure of the aluminum (original) model. An inner triangular plate is welded inside this steel body joining the body, the quill tube and this plate into a single rigid structure. The "dog bone" piece has just a minor change relating to a compression plate which presses against the "bumper". This change has no noticeable bearing on performance or weight. The mechanics for retaining the "dog bone" to the body and its pivot are the same as used in the aluminum model. The Cro-moly Flexstem has a painted Glossy Black extension and is made in three lengths, 110mm, 125mm or 145mm. It is made in two diameters, 1" or 1 1/8" in two rises, +10 degree or +20 degree. 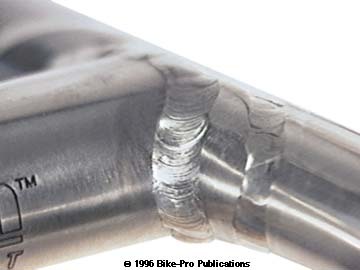 The percieved objective in making this model seems to have been to make the Flexstem marginally less expensive so that it might be considered as an alternative to a front shock fork on factory complete bicycles, (in other words a factory specified part rather than an after market replacement). For the $12 difference in price, the aluminum is recommended. The weight of the Cro-moly Flexstem in a 145mm length, with a 10 degree rise is 621 1/2 grams. The XST is a variation on the Flexstem, that adds handlebars, with very little weight gain because the extension and the handlebar assembly are made of Titanium. 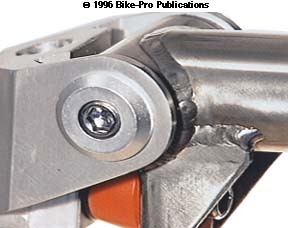 To simplify the matter, the quill, (both head and tubing), are exactly the same, and so is the bushing and brake cable arrangement, and the machined rod, caps and bolts to create the swivel as the Flexstem. It, mechanically functions the same, using the same principle. 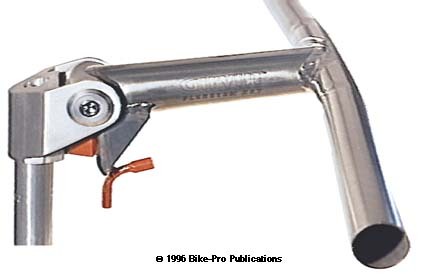 The extension and handlebar are made in the United States. The extension is made of round Titanium tubing that is compressed to an exact oval diameter. At the quill end of the extension, the perpendicular tube that the stem swivels on is Titanium, TIG welded to the extension tube. The box-like plate structure that gussets the swivel tube, extension and bushing is made of 2.3mm thick Titanium plate, TIG welded to the swivel and extension tube. The front of the extension is miter cut to wrap around the handlebar. The handlebar is made of Titanium tubing and is 22 inches long. There is a bend made on the handle 8" from each end, so the grip sections are bent 5 degrees from straight. The center of the handlebar has a curved Titanium plate welded to it, this reinforces the handlebar center, and provides extra thickness as welding surface when the handlebar is TIG welded to the extension. Both sides of the extension are laser etched with the "Girvin Flexstem XST" logo. A truly fine, light way to go for a front suspension system. This is available only in the natural Titanium color. The XST is available in a 1", 1 1/8" or 1 1/4" diameter with either a 135mm or a 150mm extension length. The weight of a 150mm long, 1" diameter Flexstem XST is 569 grams. They are a special order item taking 5 days to reach us. From time to time, Flexstem users may need to replace the spring, (elastomer bushing), in their stem. After several months under extreme compression they have been known to crack. This rupturing of the spring makes useless the shock dampening feature of the Flexstem, and replacement would be required.